If you are someone who follows politics and you want to understand what ideas and themes are really resonating in a portion our country that dictate or distort public policy, then this is a must. 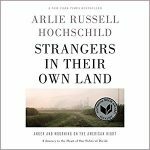 It is written by Arlie Russell Hochschild, a sociologist from Berkeley (liberal!) who makes it her job to understand, what she calls, the big paradox: why so many people on the right, especially Tea Party folks who seem to vote against their own interests. She also has a sincere love and friendship for many of the people she profiles here. Many of these voters seem to side with politicians who want less regulation while at the same time their homes or health are destroyed by pollution, oil and chemical leaks, and a total destruction to their way of life. 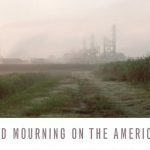 For moderates, this book will seem like it is preaching to the choir – but with more information and better profiles and understanding of Americans with different points of view. If you are a liberal, then this book is a must. You will gain some empathy for people on the far other extreme. You will realize that you have similar fears: other people jumping the line for the American Dream in front of you. You will also understand why people in red states vote the way they do. Hopefully, more liberals will also understand how their liberal purity is just as corrosive as the Tea Party beliefs. Conservatives need to read this as well. Hochschild does a great job of explaining the red-right mentality. The line jumping of the American Dream is the best description. Many older, white Americans feel they’ve worked hard to earn their place in the line for American prosperity and yet they see minorities and immigrants getting a chance to jump in front of them while benefiting from their tax dollars and hard work. Hochschild also delves into the extreme evangelical belief of The Rapture where God will come back to Earth and scorch and regenerate the land, so, for some but not all, worrying about pollution and regulations really doesn’t matter. She also points out how these people – and mainly Southerners – are strongly self-reliant. That comes from embedded history: the Civil War and then carpet bagging Reconstruction. As a result, they have deep suspicions of the federal (more Northern leaning) government and would rather trust corporations who will create jobs and not tax them. Still, a warning to staunch right-wingers. This book will anger you and test your beliefs. Many of you will think this is just another effort – to quote the old Temptations song – of smiling faces that don’t tell the truth. It will seem like another secular liberal trying to dismiss or degrade good, Christian people. More environmental regulation actually creates more jobs because companies want to locate to a region that has good infrastructure and places to live. Granting companies state or federal subsidies does very little to create jobs in a region. Most red states rely on federal dollars while most blue states provide those federal dollars. She also documents the number of people she interviewed and friended who don’t like government hand-outs but had benefited from Medicaid and other welfare type programs. Still, there are some good takeaways from this book for all Americans to use as a basis for good and future conversations about working together. Despite the cultural differences, as a nation we need each other. The North needs the South for food and for retirement. While the South needs the North for technology and commerce. The biggest item you should walk away with is that all Americans think they are victims of other groups. We are all wound collectors when it comes to politics. Southern whites think minorities have jumped the line and cost them their American Dream. Meanwhile, most white Southerners don’t realize that their freedom to do whatever they want infringes on the rest of the country’s freedom from things we don’t want – like pollution and other environmental disasters that are threatening our country. Let me throw in some contrarian thoughts from my years living down South. Although Hochschild uses the south – mostly Louisiana – as her testing ground for Tea Party type thinking, I have witnessed many examples where it would be wrong to categorize the entire South this way. I have Southern-born-and-living friends who lean liberal or moderate. Conversely, I have had reactions from Northerner retirees living in the South who look at me strange when I mention that they have only paid in 1/3 of the Medicare they will use. More importantly, this book only clarifies what I have been saying for the past 10 years. The underlying problems we face are: an aging society that is draining too much from our economy; and technology that is creating fewer jobs and lower salaries. Until the majority of us really understand that, then people will be voting with their outdated beliefs and with the special interests who say they will take care of them.